Each year the Junior League of Greenwich awards up to $5,000 to a community organization based in Greenwich, CT to provide financial support for a community need that is not being met by current Junior League projects or programs. The grant is intended to fund new initiatives or expand programs relating to community needs, not subsidize existing programs, and will be presented in the Spring of each year. The application period for the 2019 Community Grant Award is now closed. The Junior League of Greenwich proudly presented its 2018 Community Grant Award to Kids in Crisis. 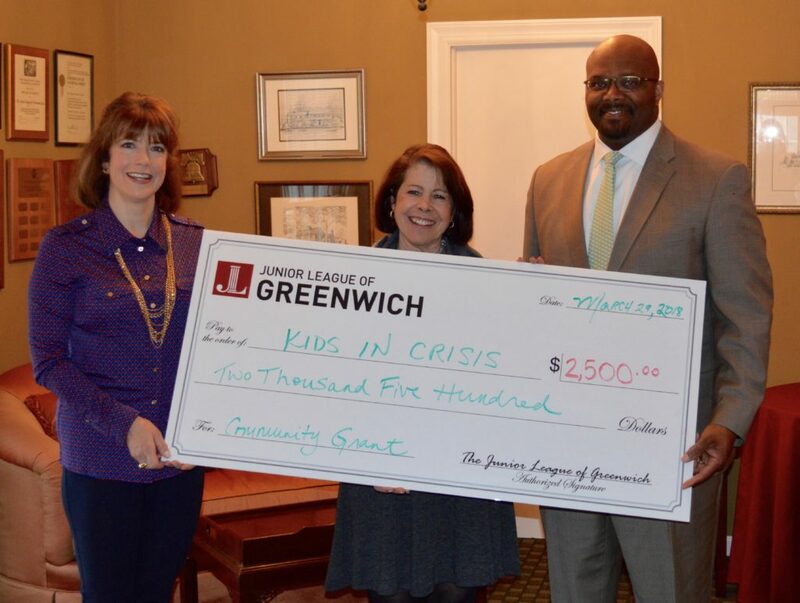 The Community Grant Award of $2,500 was presented by the Junior League of Greenwich to Kids in Crisis (KIC), in conjunction with Boys & Girls Club of Greenwich (BGCG), on Thursday, March 29, 2018. The Award will allow Kids in Crisis to expand its existing program providing “Youth Mental Health First Aid Training” to staff at the Boys & Girls Club of Greenwich. This collaboration will allow KIC to assist the BGCG in supporting the growing need for mental health services for the ages of 6 to 18 that attend the Boys & Girls Club of Greenwich. The “Youth Mental Health First Aid Training” Program is a nationally recognized, evidence-based program designed for adults who regularly interact with young people to teach a five-step action plan to help with mental health issues in both crisis and non-crisis situations. The Kids in Crisis Managing Director of Clinical Programs and its Clinical Director will provide the training to 24 full and part-time BCGC staff in four two-hour sessions over the coming year. This training will greatly increase the competency of the Boys & Girls Club of Greenwich staff to meet the compelling needs of the kids they serve.